← We’re Changing Things UP! The Swiss Cottage, built by George Morrison for Governor Evans in 1874, was known by many names through the years. That’s right, tiny Morrison was once a college town. For just four years, 1884-1888, Morrison was home to “Sacred Heart College,” really more of a prep school as some students were less than 14 years old. Originally founded by Jesuits in Las Vegas, New Mexico, the new Sacred Heart for Colorado opened in a former hotel building with just 24 students. The building selected was one of Morrison’s dominant structures for nine decades. 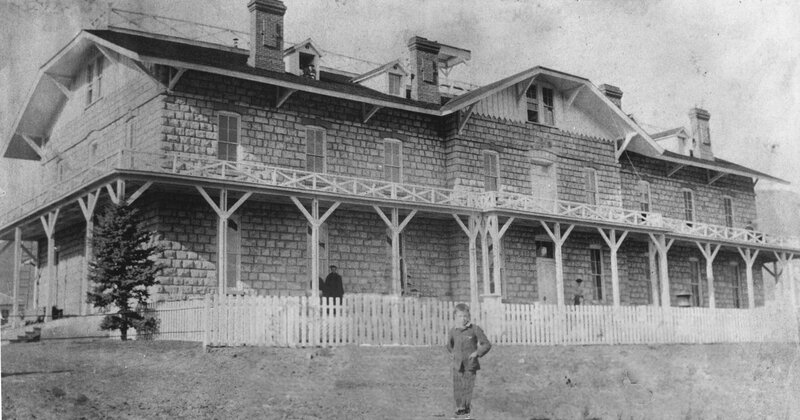 Known first as the Evergreen Hotel or the “Swiss Cottage,” the three-story building housed the students and their Jesuit instructors. A smaller building on the site provided servants’ quarters. By 1888, the remote location was deemed inconvenient, and the college moved to a new campus at Berkeley, close to Denver, and became Regis College (now University). A close friendship between the Jesuits and John Brisben Walker facilitated the trade, with Walker acquiring title to the Morrison location and renaming it the “Mt. Morrison Casino.” Read more about the Jesuits in Jefferson County here. Its sandstone bulk loomed over the town’s skyline from 1874 to 1982, when it was demolished after a long and colorful history.